I’m really happy with November’s GlossyBox, especially after last month’s slightly disappointing box. 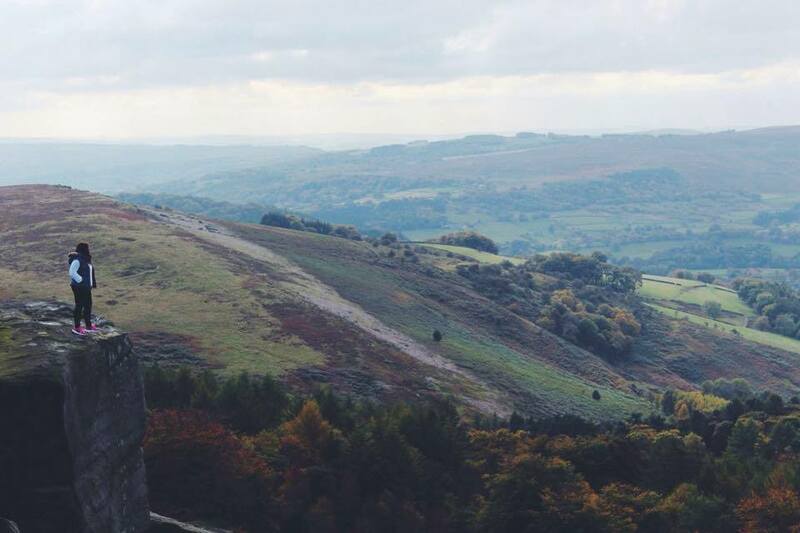 Feel free to check out last month’s video to understand why but for this post, let’s focus on this month’s positives! This month’s box is themed around preparing for the party season, with gifts to help with the run up to the Christmas parties and work events. In this month’s box I received five products and one sweet treat from Raffaello, which lasted for about five seconds after this photograph was taken. It tasted like a coconut, white chocolate, Ferrero Rocher. After some googling to find out where I could buy more, I discovered that they are actually made by the same company and can be found at a variety of stores. Everybody needs a razor. And in a world full of choices why not have one that’s raspberry scented? Well, Wilkson Sword have the razor for you. To be honest, I think that this is a step too far and completely unnecessary but the Wilkinson Sword itself really is a great product. Offering a slick shave and smooth finish I have nothing negative to say about this item. This Jumbo Eye Pencil offers a creamy lightweight shade of eye shadow in a very usable formula. Although the shade is titled ‘khaki’ I would say that it is more of a shimmery grey shade with a brown undertone. Never the less the eye crayon is a great colour to be used on any skin tone.I chose to add a lighter basecoat to really make the colour pop. Long lasting, this product stayed on the eyelid throughout the day but was removed easily enough with my usual evening skincare routine. 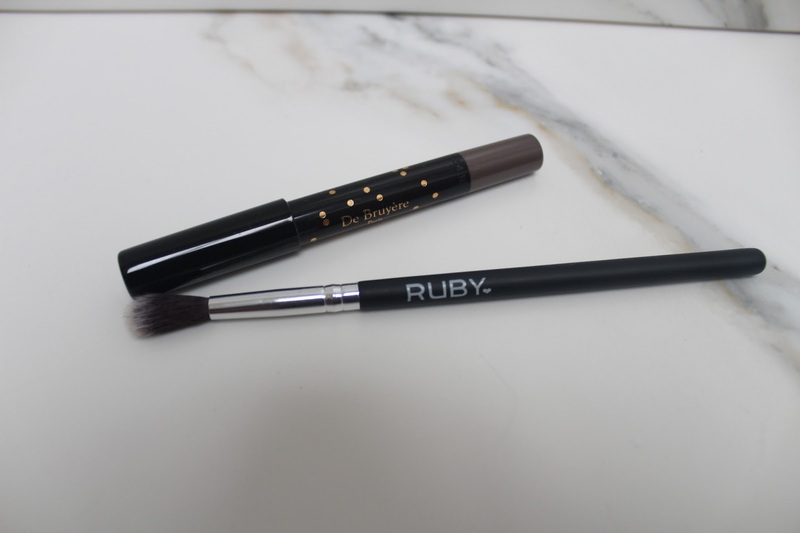 This Blending Brush from Ruby Professional is sure to be a great addition to my makeup brush collection. Although slightly lighter in weight than I would usually choose the brush itself offers a lovely soft head which effortlessly blends the De Bruyere Jumbo Pencil around the crease of the eye. This keratin filled spray promises to lift each root and thicken each strand. This is certainly something that I’ll try on my hair. Although I have plenty of it, the strands themselves are actually quite fine. I’ll be able to give a more detailed review once the formula has had a chance to make a difference. 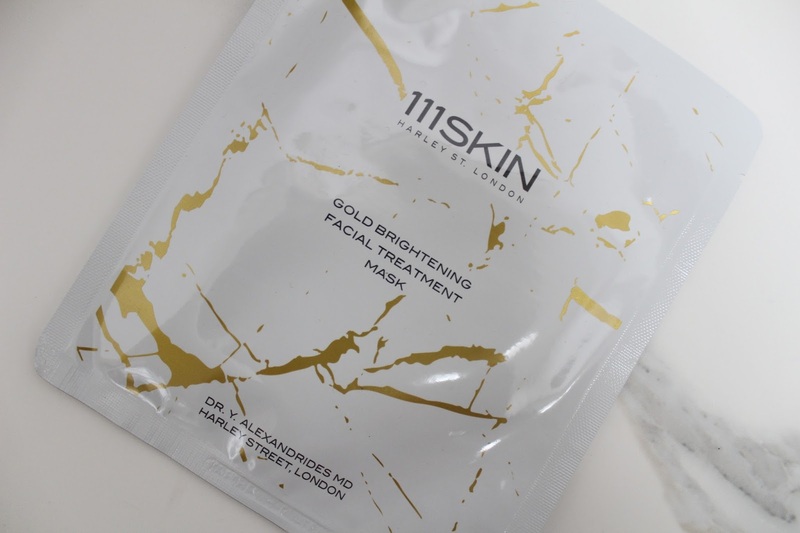 Saving the ‘best’ product until last,we come to the 111 Skin Facial Treatment Mask. This product retails at a somewhat steep £20 and offers one mask, to be worn for 20 minutes. ‘Filled with arbutin to brighten the skin, silk amino acids to condition and centella asiatica to stimulate collagen production’ this product really does make a difference to the skin. I left my mask on for a little over 20 minutes (to squeeze every pound out of my use) and could see a visual brightening to the skin almost instantly. Although £20 is quite an amount for a single use face mask, with almost instant results I completely understand the associated cost. Will I purchase this again? Possibly. Though I doubt I will be abiding by the three times a week recommendation I would be sure to use this mask again as a treat ahead of a special night out, or even after a long week in the office. 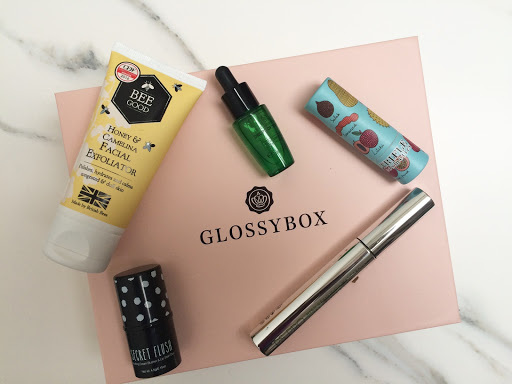 Thank you GlossyBox for such a great box this month! I love the excited feeling I always get when I receive the month’s Glossybox. Opening the black postage box and finding the baby pink box inside makes the moment feel like a special day, where a gift has been delivered after being carefully selected just for you. Of course, the Glossybox isn’t exactly unique to me, but the moment still remains special. This month’s box was the usual pink box which when opened greets you with pink tissue paper and a beautifully tied black bow. I was always the child who opened their Christmas present slowly, being sure to not rip the paper and this habit extends to the Glossybox. No amount of excitement could lead me to purposefully rip the beautiful packaging! Once inside I get the first glance of the products inside. Now, I don’t know about you, but I always spend the days before my box arrives searching YouTube for the month’s UK unboxings. Surprisingly this doesn’t spoil the surprise. This month’s box was guest edited by Estee Lalonde, a well know beauty and lifestyle blogger and vlogger. The pieces inside every box were approved by her. Estee even left her very own mark with an unknown bottle of sweet smelling shampoo for all to use. The only way to find out which brand this shampoo belongs to is to visit her blog for the grand reveal. In all honesty, this month I wasn’t as overjoyed with the contents as I usually am. This may have been my fault. 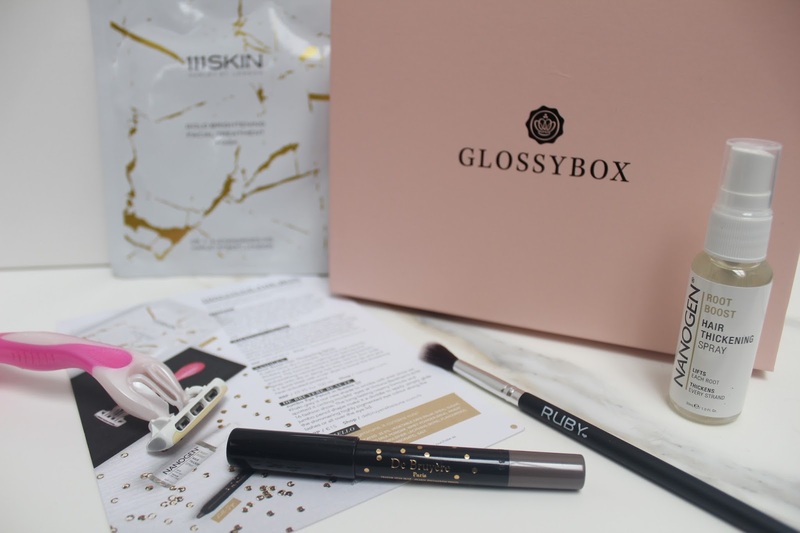 I only decided to resubscribe to Glossybox in the third week of the month. From what I received compared to what others received in their boxes I can only assume that as the main stock runs out the ‘best’ products are switched out for other gifts. Having reviewed my initial disappointment I now understand that this should have been obvious to me as I subscribed! I’m now back on the monthly plan, and eagerly awaiting my freshly delivered (fantastically packed) box of goodies this month.